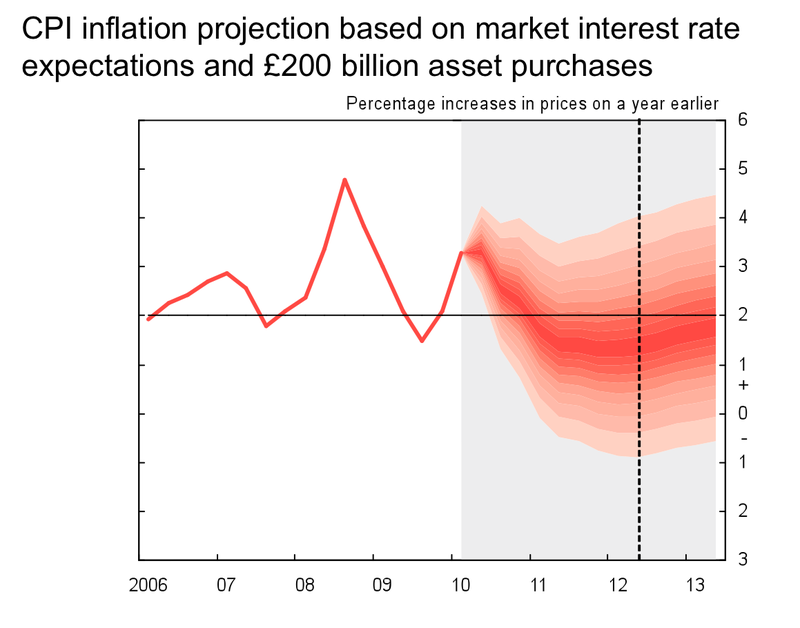 So, what will happen to the Bank of England's interest rates now that the new Coalition Government is settled in? Personally I'm guessing 'no change', at least until after the dust settles following the emergency budget in a couple of weeks time. The Bank of England is expected to hold interest rates at a record low this week -- and possibly for the rest of this year -- as it seeks to safeguard Britain's fragile recovery and offset painful government spending cuts. Maybe not going anywhere fast. Another month or two of CPI at 4%+ and they'll have to raise. Not arguing with you - however the argument used thus far to keep rates low and steal from creditors by way of inflation has worked perfectly and nobody has noticed, bonds are still selling and so on. It's that fear [of deflation] argument which works so well, a bit like why we had to invade Iraq or we'd have had bombs dropped on Britain within 45 minutes. Allegedly. Which was of course nonsense. But: how long would inflation have to remain riotous and/or what level would it need to go to, to necessitate raising rates? Where and what would be the trigger? If there's deflation in the money supply and inflation in consumer prices (what we have now) is that an inflationary or deflationary environment? I'm guessing only the former (money supply) is the important one. Don't know anything about him except he's quite entertaining to watch - "Mugabe was Bernanke's mentor"
He basically predicts the collapse of Western economies, with the day of reckoning extended by printing more and more and more money and continued loose monetary policy. Nah - they'll keep them low for fear of damaging the 'recovery', citing their brilliant get-out clause that they expect rates to come down in the mid-to-long term. Every month that goes by is month closer to the rise, i'd say a about a 10% chance this month. Maybe 25% chance next month after the budget. Wish they bloody get on with it though! Like I said, they're factoring in lower CPI, so why would they raise? Up to 0.75 or even more I reckon. What else will let the reality kick in? And didn't Steven Gerrard deck a DJ in a Southport club, in case the DJ was going to deck Steven Gerrard? Edit: No change in rates, then up by 10% all of a sudden one day. Do you think if we all concentrate hard enough we can make them raise the rates, or is there something similar to a rain dance we can do to influence the rate Gods? You have a bit of a wait. They have 200 bill in QE they need to reverse first. That's funny, it looks as if 2 percent is the floor, not the target, as soon as it hits two percent or lower they make it go back up. I think it's some markets out there not us that can influence the rate gods. They're stopping where they are, till the "markets" complain. At least that is my view. It seems there has only been a slight murmur from the MPC about being worried about high inflation. Do you think they'll ever yank that out? They don't have a date to do so by do they? Therefore they'll just procrastinate for another 10 years, saying that it's not prudent to do so as there is a lack of liquidity in the banks. Being pessimistic, I reckon the base rate stays where it is for at least another 6months. It really is all a bit surreal. They think they are Gods, yet they have spent their time manipulating the economy and completely ******ed it to the point of bank runs and bankrupting the country. Worse they think they deserve more opportunity to carry on.